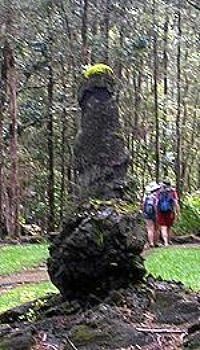 The Lava Tree State Park (also known as the Lava Tree Monument Park) is located in the Nanawale Forest reserves in the lower Puna District near the town of Pahoa on the Big Island of Hawaii. 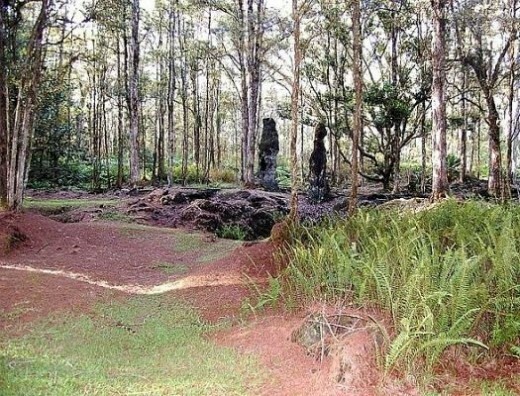 Lava Tree Monument State Park is a very unusual park and I believe it is the only park of its kind in the world. 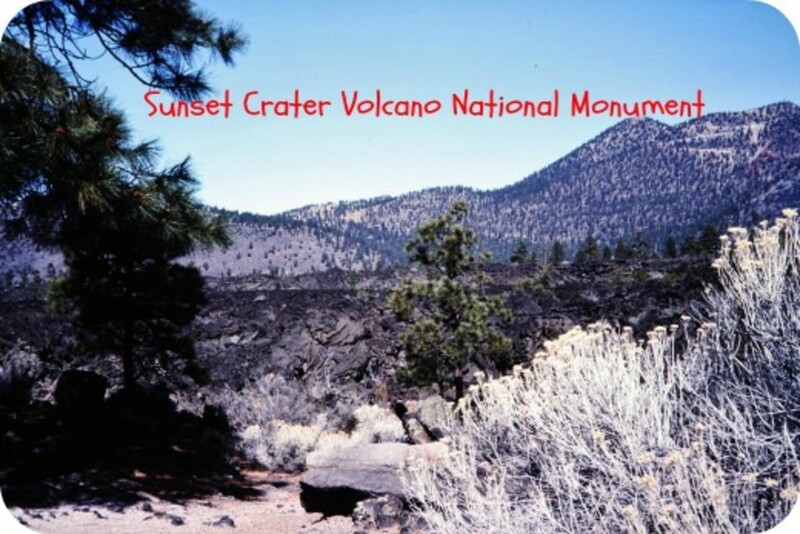 What makes this park so unusual are the volcanic features that are located there. The park is full of lava trees, just as the title specifies. Lava trees can actually be found in several other locations on the Big Island of Hawaii, however, this particular park is isolated and dedicated to the abundance of excellent lava tree examples in one area. It is also the most easily accessible. 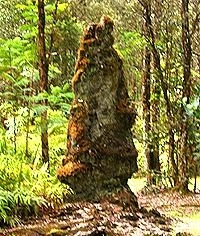 Another example of lava trees can be found in the Hawai'i Volcanoes National Park. 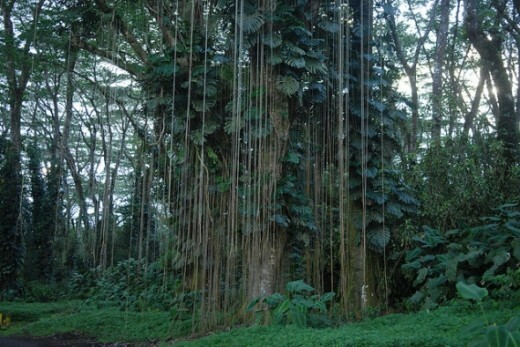 What is a Lava Tree? I'm glad you asked. 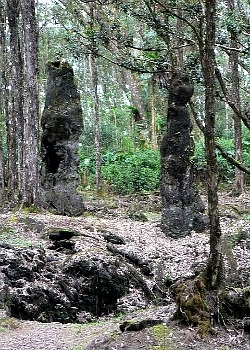 Lava trees are the result of an ancient lava flow that quickly flowed through this rainforested area leaving in its wake lava molds of the many tree trunks that were once there. After the passing of hundreds of years, the rainforest has reclaimed the area, with moss covered remnants of what was once a rainforest of O'hia and Monkeypod hardwood trees. 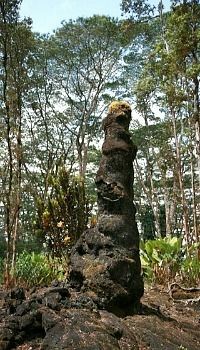 Lava trees are made when the molten lava coats the trees in one of two ways. First, a fissure can open from the pressure of the molten lava beneath, spraying fountains of the liquid fire into the air. The falling lava coats the outsides of the tree trunks while burning out the insides of the trunks leaving a lava mold around the tree. The second way the lava trees form is when the red, orange, yellow and white liquid fire flows with the lava into a basin-like area filling it with the intensely hot lava. As the flow continues on its journey, draining from the area, it leaves behind the rock tree formations. 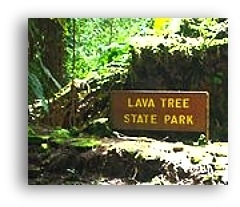 The Lava Tree State Park was formed from this second method. Over 200 years ago in 1790, the east rift of the Kilauea volcano opened up and issued a huge pahoehoe lava flow. This river of molten lava spread rapidly through this wet section of O'hia tree rainforest. The lava flow buried the 'Ohi'a trees up to 11 feet deep in molten lava. 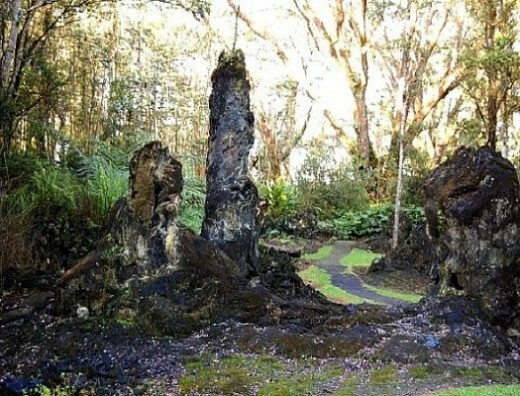 The cool wet trees that were covered by the molten lava then cooled the lava that coated them. 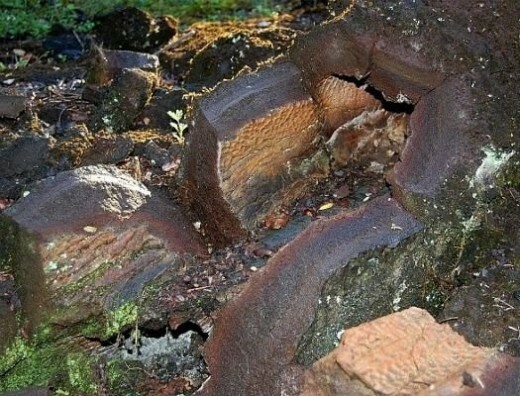 At the same time, the extreme heat (estimated at about 2000° F) consumed the insides of the trees leaving a perfect structure mold where the trees once grew. 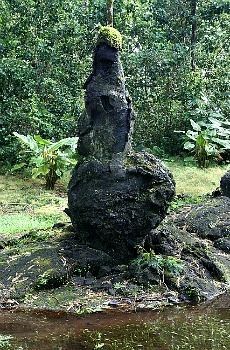 The tree trunk molds are so perfect that you can still see the imprint of the bark in the lava rock itself. 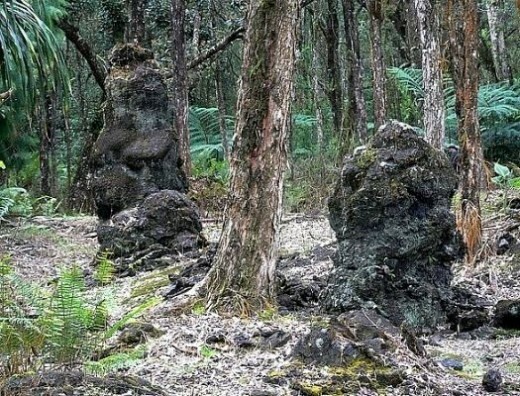 Shortly thereafter the earthquakes and volcanic eruption caused the nearby fissures to open, allowing the molten lava to drain away from the slightly cooler lava that surrounded the trunks of the trees. 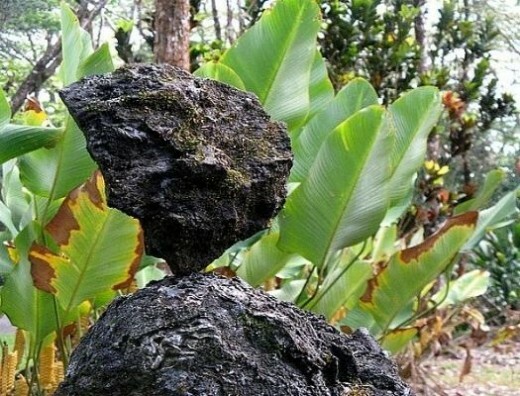 The lava cooled by the trees were already beginning to harden. 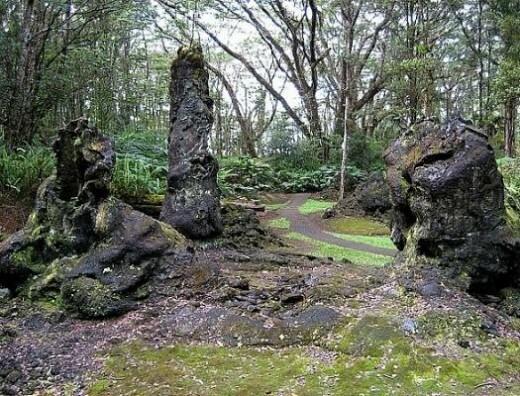 These trees did not fall; they remained upright above the ground, pointing to the sky.The tree structures left behind are vertical, hollow, lava tubes that stand as monuments to the trees that once were. 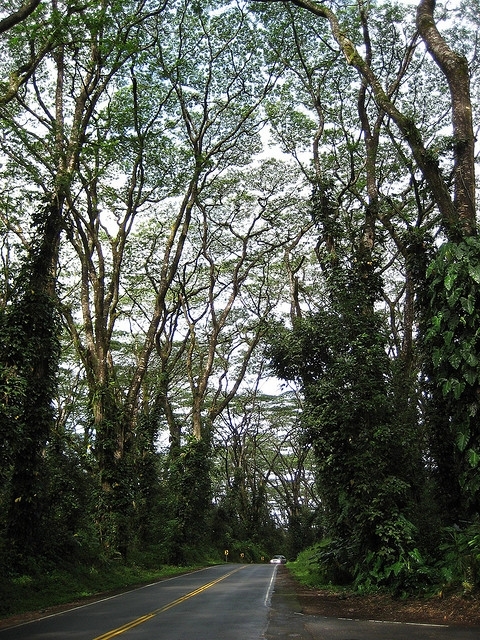 The Nanawale Forest, where the Lava Tree State Park is located, is about 500 feet above sea level and is 17.1 acres of native Hawaiian plants, imported tropical plants, and of course, the many lava trees. 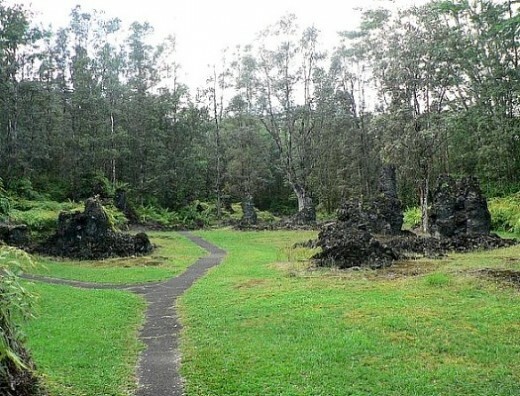 Most of the lava trees from the 1790 lava flow are still standing. The ones that have fallen, resemble in looks the petrified trees you would find in the Petrified Forest of Arizona. The land was once part of a ranch belonging to William Herbert Shipman. 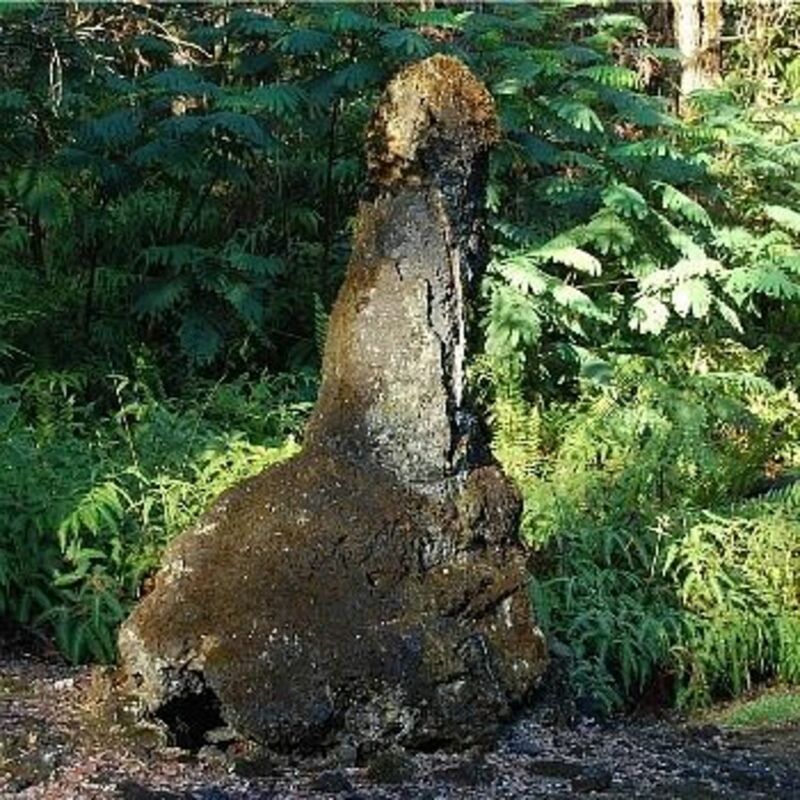 Although ancient Hawaiians knew the molds were from a lava flow, one of the first to put it in writing that they were from former trees was Rufus Anderson Lyman. 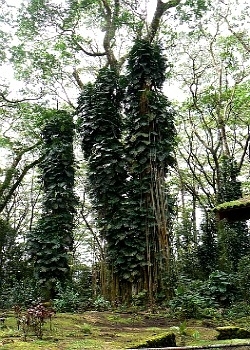 This is a giant banyan tree at the park that is covered with giant philodendron known in layman terms as Giant Elephant Ear. If you look closely, in the lower right-hand corner of the photo is a tall skinny tree that looks like a coconut tree. It is actually a papaya tree growing wild at the parks edge. You can see the green papayas at the top of the skinny papaya tree trunk. Another amazing act of nature located near the front entrance of the Lava Tree State Park is the rather large chasm in the earth's floor that occurred during the 1790 Kilauea eruption. 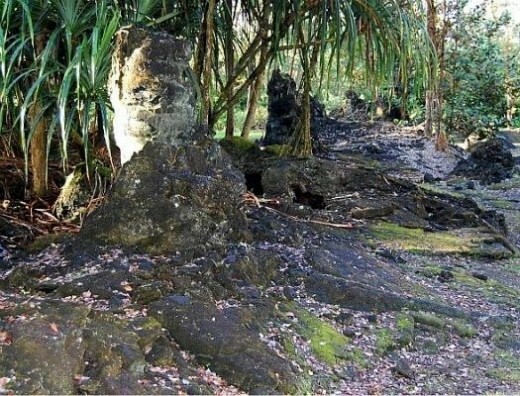 Throughout the park grounds, the land is very uneven, almost wavy, from the many earthquakes in the islands past and over the last several hundred years the huge crevices have been masked over with the growth of the rain-forest take-over. There are updated bathroom areas and three rustic picnic areas offering protection from the elements, along with picnic tables and a lava rock fire pit with a grill. Unfortunately, there is not any drinking water available, so be sure to bring your own. I am not currently aware of any water facilities becoming available once the latest renovations are completed at the beginning of May 2011. Remember to Bring a Camera! 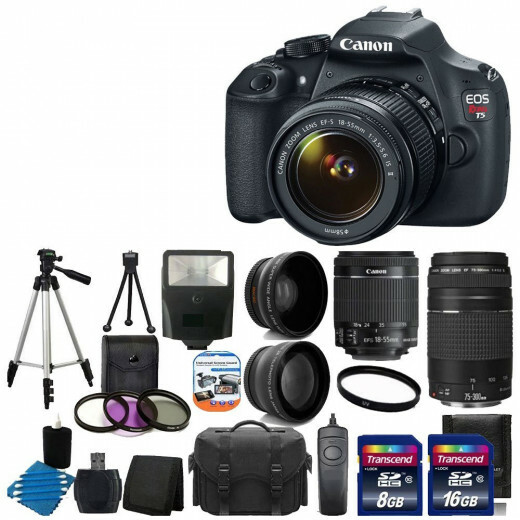 Everything you need to take excellent digital photos to upload to your blog, especially when blogging about your travels! 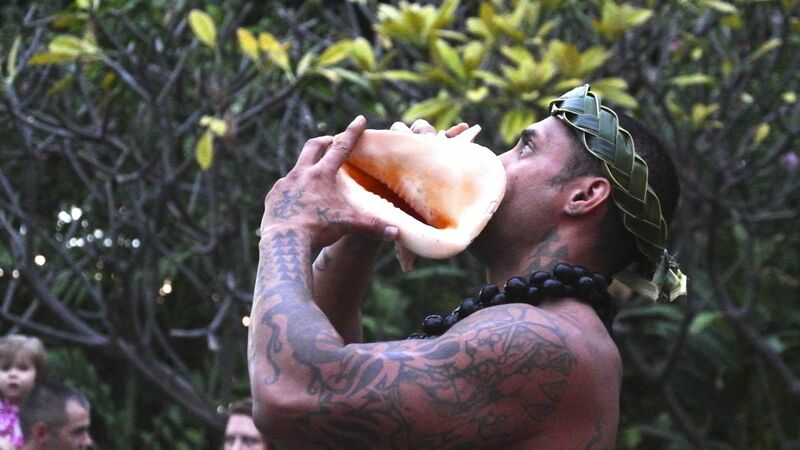 Welcomed Guest and Protect Our Aina (Land)! Please Pick Up All Your Own Crap! Have fun while at the park! Laugh, point, snicker or blush. Hug a lava tree for a photo shoot if you like, but please, please, please be careful not to break anything off of these very ancient relics of nature! The start of the trail can be found just off the parking lot. 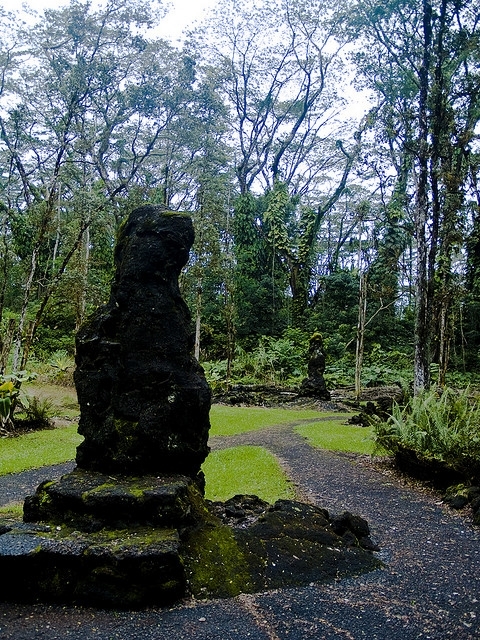 The paved path makes an easy to walk loop through the unique lava tree formations. 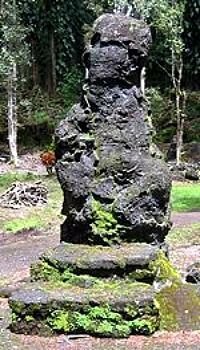 The walk is a short, but enjoyable hike through the Lava Tree State Park, but some of the best lava tree specimens are at the entrance to the park. 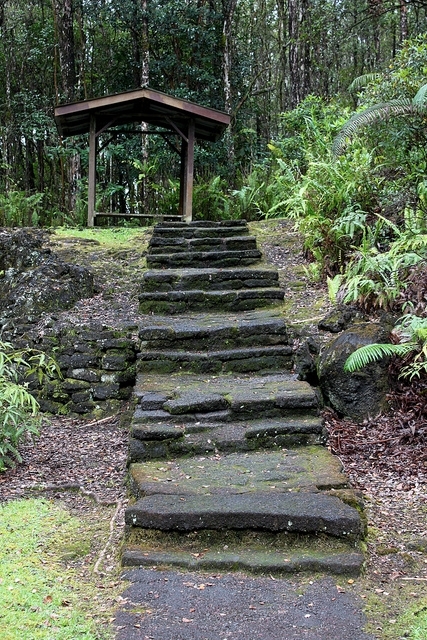 These ghostly structures are now covered with moss and surrounded by the lush, tropical foliage of the Hawaiian rainforest. The walk through the lava trees takes about 45 minutes to an hour, depending on how fast you walk and how many times you stop for photo sessions of this enchanted rainforest. The walk is an easy one for everybody, including the very young, and the elderly. Work is going on right now at the park to restore the cracked pathways making them wheelchair accessible. 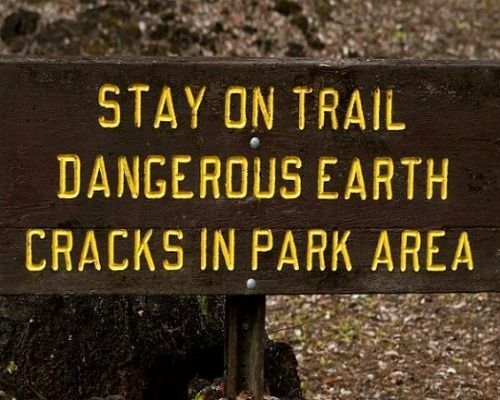 Throughout the park, along the trail of the Lava Trees Loop, there are several warning signs reminding visitors to stay on the trail. 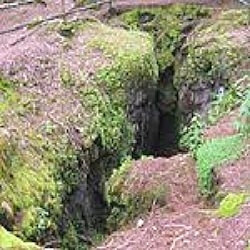 There are so many huge ground cracks and crevices that are remnants of the many earthquakes and volcanic eruptions of years gone by. If you were to fall into one, you could easily be swallowed up without anyone ever being aware of your disappearance. 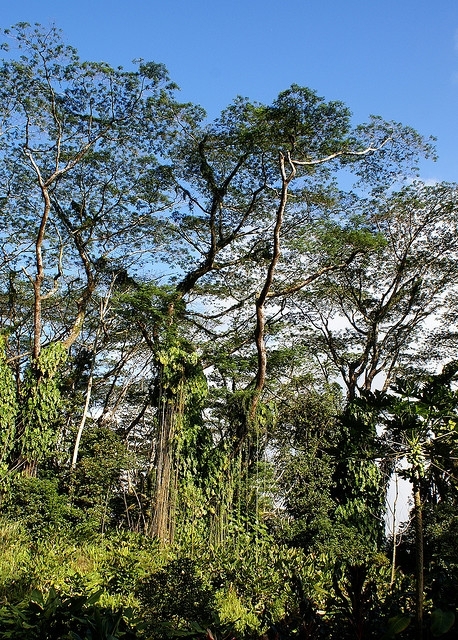 Many of the dangerous, deep fissures, are hidden by the foliage of the rainforest making them difficult to see. These deep fissures and lava tubes are a stark reminder to the fragility of the Big Island from the constant volcanic activities, earthquakes and the occasional tsunami. I don't mean to be a "Party Pooper", but it is important to continue to protect Hawaii's natural beauty and resources while keeping safe at the same time. Mountain Biking is not allowed on this trail. You Must Stay On the Trail for Your Own Safety! For obvious reasons open fires are not allowed, however, you may grill on the grills provided at the park entrance picnic areas. Please remember to pack out everything that you packed in, including your own garbage! 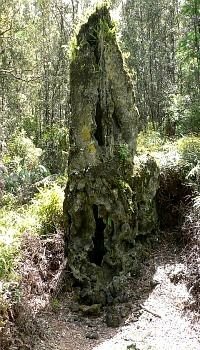 This is a tree that has fallen and resembles a petrified tree. Are Those People Off in the Distance? Is it a witch or a demon? Have You Ever Been to a More Unique Natural Wonder? If "yes" Care to Tell Us Where? Don't Forget the Bug Juice! If you don't want to get eaten alive by mosquitoes, remember to bring along your insect repellant! The mosquitoes are vicious to people that are not use to them. 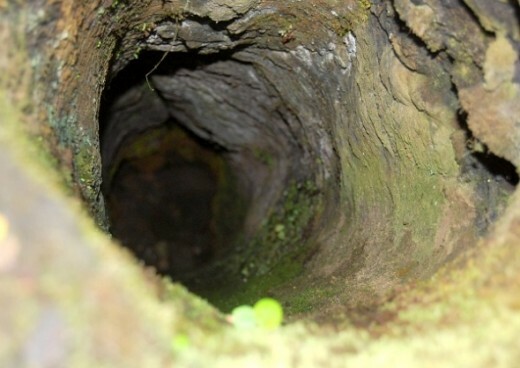 This is looking down the tube of a lava tree that is broken at the top. Notice the moss growing along the edges of the tube. Go south on Highway 130 towards the town of Pahoa, known as Kea'au-Pahoa Road. Pass the first intersection that goes into Pahoa by staying to the left. Continue to the traffic light, where the Pahoa Bypass Road, Kea'au-Pahoa Road and Pahoa-Kapoho roads meet. At this intersection, make a left (East) onto Highway 132, Pahoa-Kapoho Road. Continue for about 2 1/2 (2.7) miles to Lava Tree Road on your left. 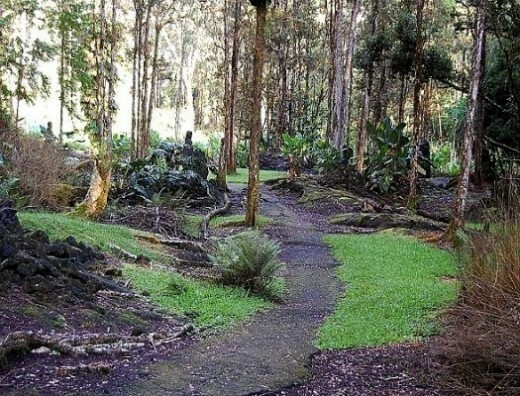 The park is located on your right, about 150 feet down Lava Tree Road. 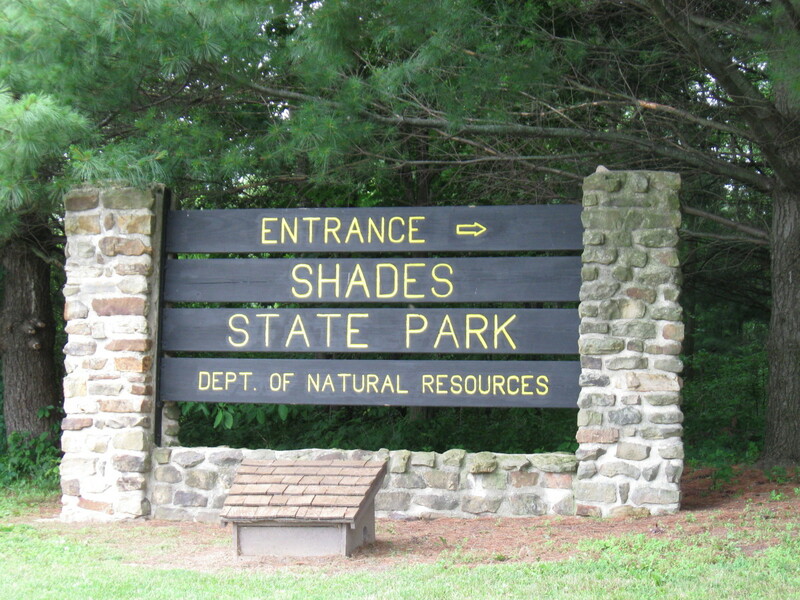 Keep your eyes open for the park entrance sign. 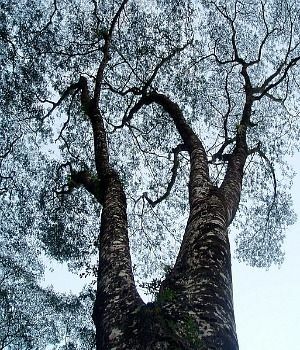 There are so many trees in the area because of the location in the Nanawale Forest, that you may drive right passed it before realizing you have gone too far. This map may help! 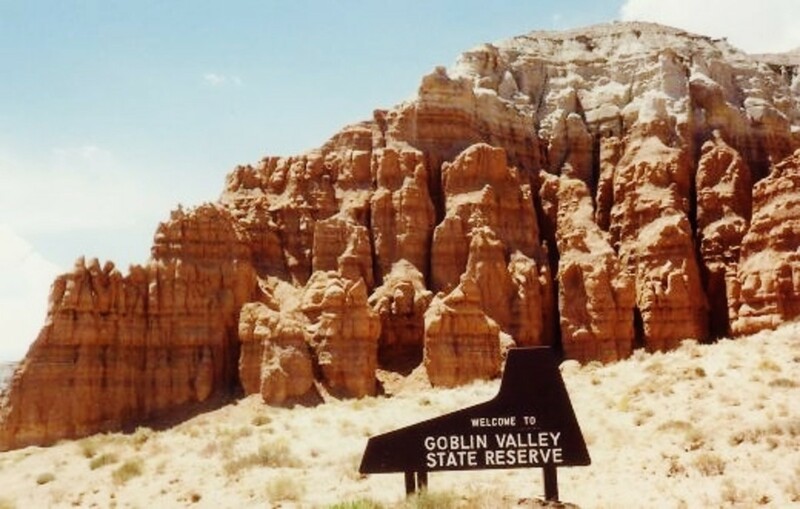 Goblin Valley State Park in Utah - Unearthly Gremlin Creatures Abound! 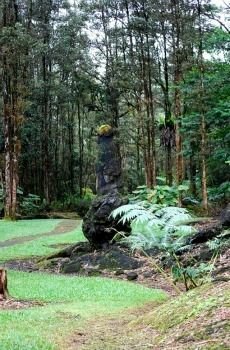 What Do You Think of this Unique Hawaiian State Park? @TransplantedSoul: Yes it did. I will need to update this lens. @goldenrulecomics: Thanks for stopping by. This looks like a great place to visit. You said that the park is close and we re-open in the beginning of May 2011. Did this happen? I would love to visit there someday. 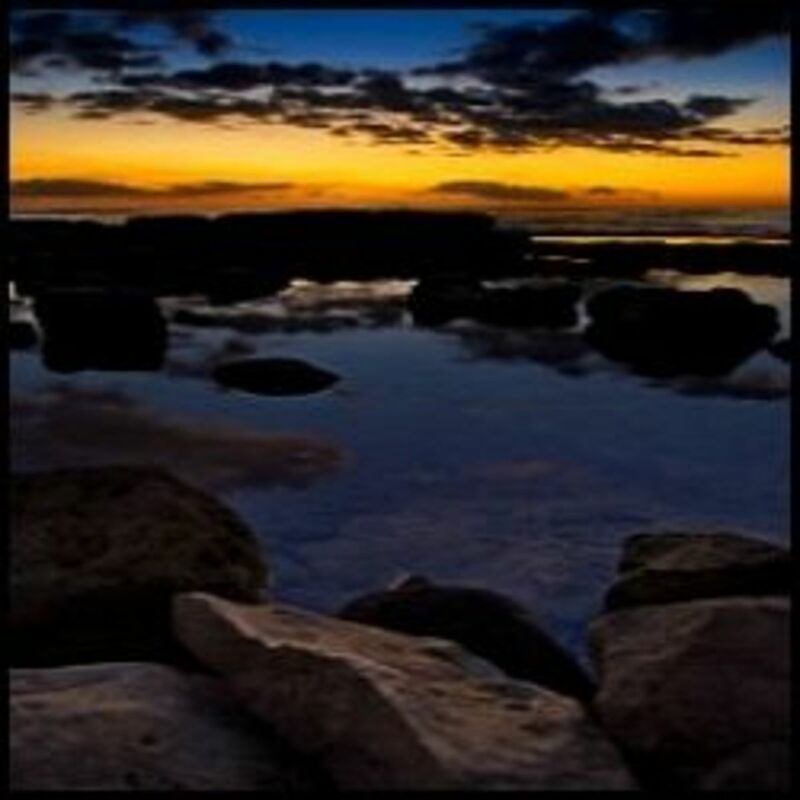 Nice photos! Very interesting lens, so well put together. I learned something new. Glad you shared this. I love this park! I did a series of paintings after photographing a model in that park because it is so interesting. It is almost eerie, with all those sculptured lava trees standing. Thumbs up and angel blessed. Looking for you new lens you wrote me about. Well written lens. As a fellow native of Hawaii, I am often frustrated at the inaccuracy of many articles written about Hawaii. Hope I can do as well. Looks like an amazing place. I've been to three of the Hawaiian Islands, but not the big one. I certainly would love to see this. 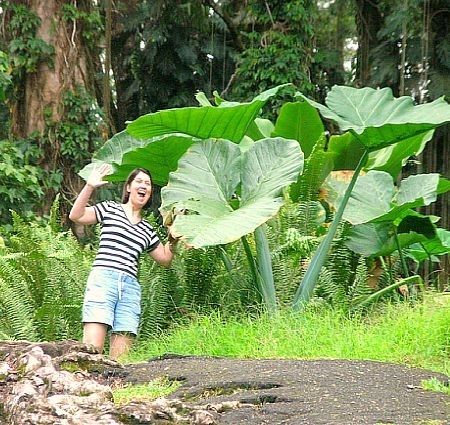 What a cool lens- indeed, This Hawaiian state park is unique! Angel blessed and lensrolled. What a great place- would love to visit and see the lava trees. Many thanks.